China, 1994/2008, 93 minutes, Colour. Brigitte Lin, Leslie Cheung, Maggie Cheung, Tony Leung Chiu Wai, Jacky Cheung, Tommy Leung Ka Fai, Li Bai, Charlie Leung, Carina Lau. Ashes of Time was considered a classic in the mid-1990s when it was first released. Wong Kar Wai had made a great impact with his Chung King Express and his films from Hong Kong. He went on to become more celebrated worldwide with such films as Happy Together, In the Mood for Love, 2046. Dissatisfied with the copies available of Ashes of Time, Wong Kar Wai re-edited it for 2008 and rereleased it. On the surface it looks like a martial arts film. 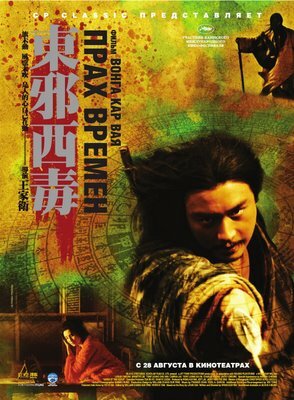 However, it is very much Chinese storytelling, a blend of action, mysticism, philosophy. This makes it rather difficult for a western audience to understand – although the characters are vivid, the interactions strong, the presentation of imagination and reality intriguing. The film has a strong Hong Kong cast led by Leslie Cheung who does the voice-over for the narrative. 1.The work of Wong Kar Wai, in the 90s, revision in the 21st century? Reputation? The decision to re-edit his film? 2.Chinese history, martial arts? A mythical period, costumes and décor, production values? Special effects and action sequences? The atmospheric score? 3.The photography, the desert and its ambience, light, the mountains? Beauty? 4.The title, memories and meanings? 5.The period for the film story, a mythical time, a desert location, the occasion an eclipse of the sun? The following of the seasons? 6.Assassins and their business? Ou- Yang and his being a manager of assassins? The visit from Huang? Their past association? The gift of the wine from the woman? Huang drinking and losing his memory? Ou- Yang not drinking? Huang and his behaviour, the romance of Peach Blossom? The importance of the blind swordsman, his wife, Huang’s dalliance, the husband’s revenge? The encounter with Murong Yin? Her brother? Hiring the assassin to kill Huang? 7.Yin and her brother Yang? Ou- Yang and realising the two facets of the one person? The fights? 8.The young girl, wanting Ou- Yang for vengeance, the meagre pay? Ou-Yang? refusing? Her own fight, the water image and the dream? 9.The blind swordsman, taking on the mission for the girl, the kiss, the fight, death? 10.The blind swordsman, his ambition, fame? Fleeing his wife? The bandits? The battles, losing the finger? The contrast with Ou- Yang? 11.Ou- Yang and Peach Blossom, Huang and his visit? Ou-Yang’s? former love, regrets, leaving her, Huang bringing the wine from her? Ou- Yang drinking it and going home? 12.A critic said this way of storytelling was somewhere between the exotic and the absurd. How true? Stylised film-making, symbolic characters and narration? 13.The use of Buddhist traditions, the seasons, the aphorisms, change, honour, love and greed? The role of memory, disconnection, rediscovery of self?